Both the State of Georgia, and the Metro-Atlanta Area have a long and historic heritage of Golf. The first Georgia course, and the second in America, was opened in Savannah in 1794. During the 1800's and early 1900's, most of Georgia's	venerable golf clubs were built, including the world renound Augustus Country Club. Yet Atlanta Golf is probably more closely identified with a player, rather than a specific course. Robert Tyre Jones, Jr., otherwise known as Bobby Jones, has become the very embodiment of golf and its attributes of honesty, integrity, discipline and skill. 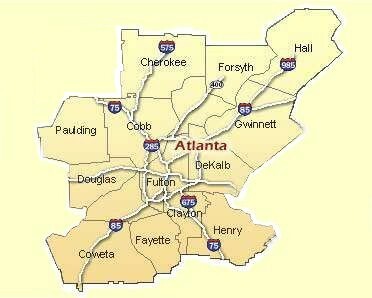 Bobby was born, raised and buried in Atlanta, Georgia. The Metro Atlanta area spreads out over some 13 counties and offers a wide range of Golfing Communities ... from the very affordable ... to the very exclusive. Almost all Metro-Atlanta Golfing Communities offer facilities such as swimming pools, tennis courts, parks, playgrounds and more ... but while some offer private courses, others surround public or semi-private courses. As a general rule, private course communities will tend to be more expensive, but when compared to other similar communities elsewhere in the country, these represent excellent value. Golfing In Atlanta Tends To Be A 365 Day Affair. Communities attached to public and semi-private courses tend to be more abundant and even more affordable, and membership in the Golf Club may be optional with a moderate initiation fee payable when joining. Eitherway, the choices are significant with great options for every type of golfer. Welcome to Georgia - where golfing is a peach!